There are reports suggesting that the upcoming Galaxy Note 2 will feautre a 5.5" YOUM flexible OLED panel. The display will not be bendable though. It will be based on a plastic (polymide) substrate and will be virtually unbreakable. It will also be thinner than current AMOLEDs by around 0.4 mm - which will enable Samsung to use a biggest battery. 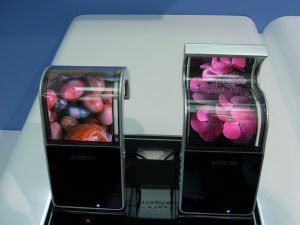 We do know that Samsung has plans to launch flexible YOUM panels by the end of the 2012, I'm not sure if the first screen they'll produce will be a large 5.5" panel. In any case, we don't have a lot to wait - Samsung confirmed that the new Note will be announce on August 29.